It is time to rotate a few costumes so here we go! 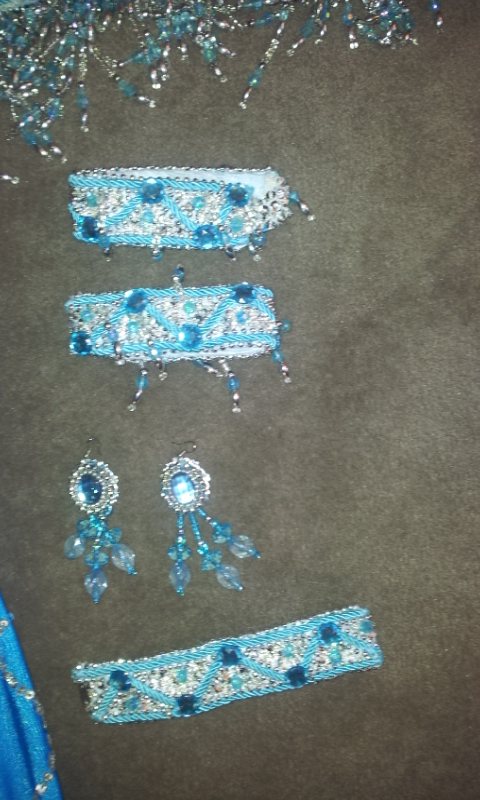 First up is a gorgeous Toni and Robbi turquoise costume SOLD with extremely three dimensional, lush beading. This set is actually heavy! 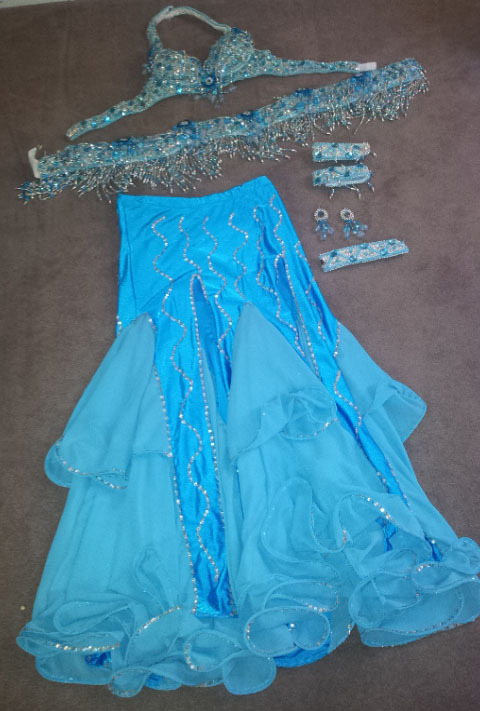 It comes with a super swirly skirt with 2 slits in the front, 2 arm bands, a wrist cuff, bra, belt, and earrings! Bra has a 30″ underbust and the cups measure 6h x 6v x 6.5″ diagonal, on the inside. I pushed the tape in over padding so they may even be deeper. 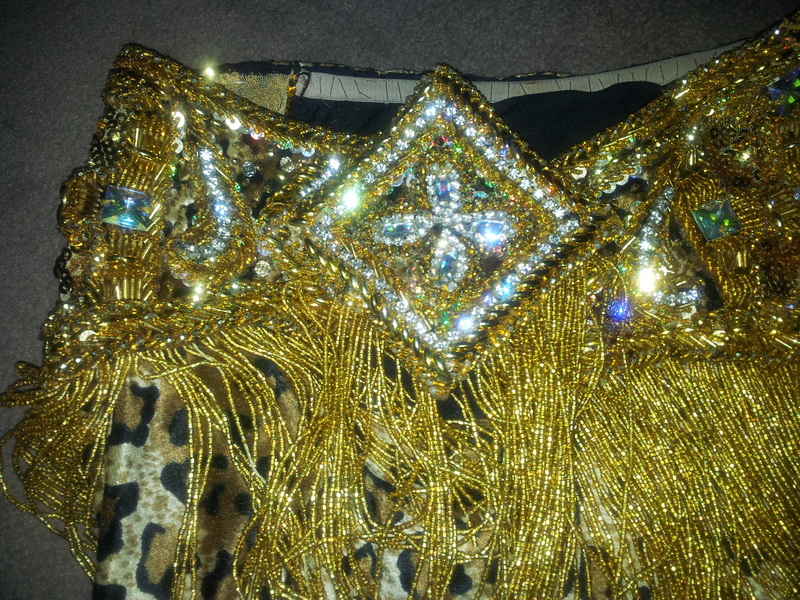 Belt is 37″ long, but there was a piece added by the previous owner so that she could wear it really low. She did an amazing job and you can not tell but it could be removed if necessary. 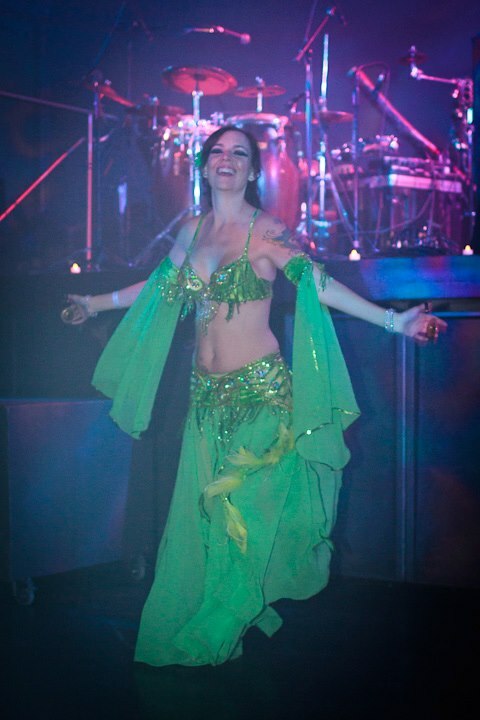 The skirt is 32″ unstretched at the top and stretches up to 38″ and it is 36″ long laying flat. I never put in elastic and just pinned it. The skirt is 36″ long. Next up we have a Lime Green Bella! ON HOLD! 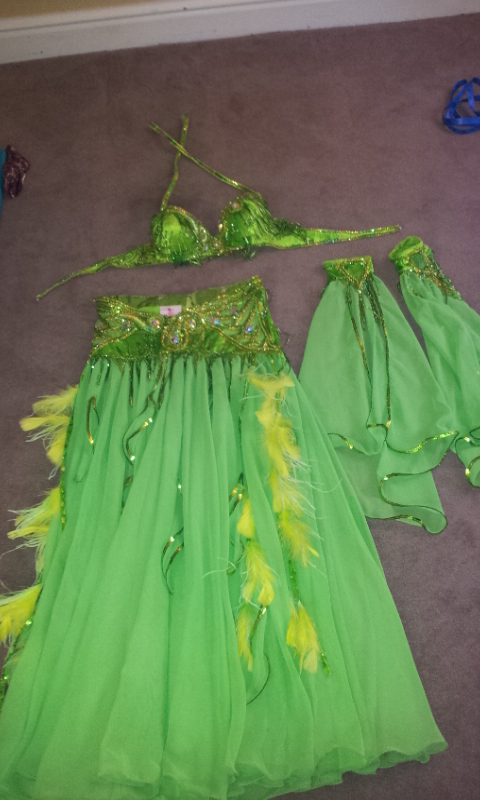 This bella is bright, fun , and feathered! It comes with a bra, combo skirt and belt, and two arm cuffs with drapes…oh, and a chiffon veil! 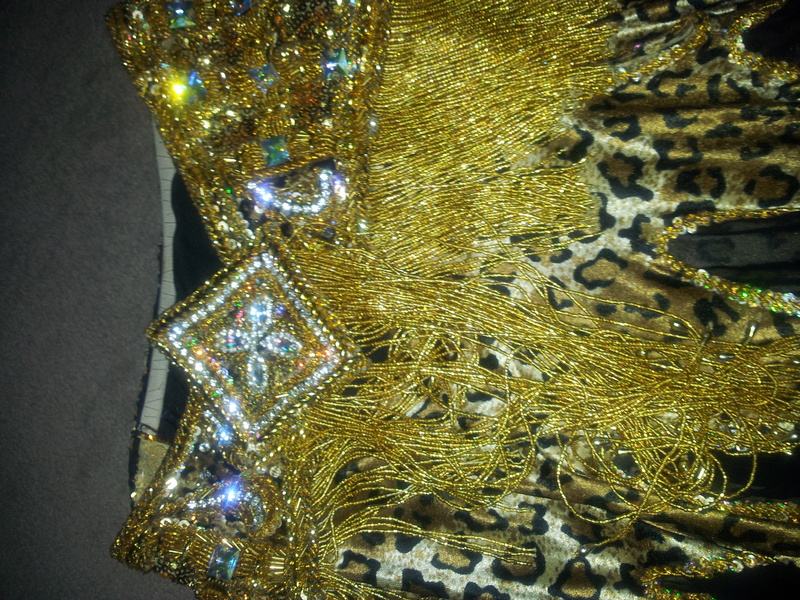 The skirt is fitted through the hip and then open up into a chiffon skirt. I typically don’t wear full skirts but this was so cute that I bought it anyways! Bra has a 35″ underbust and the cups are 5.5″v x 7″h x 7″d. The skirt is 38″ long laying flat and the top is 32″-33″. I am asking $375 plus shipping and paypal for this one but am open to reasonable offers. 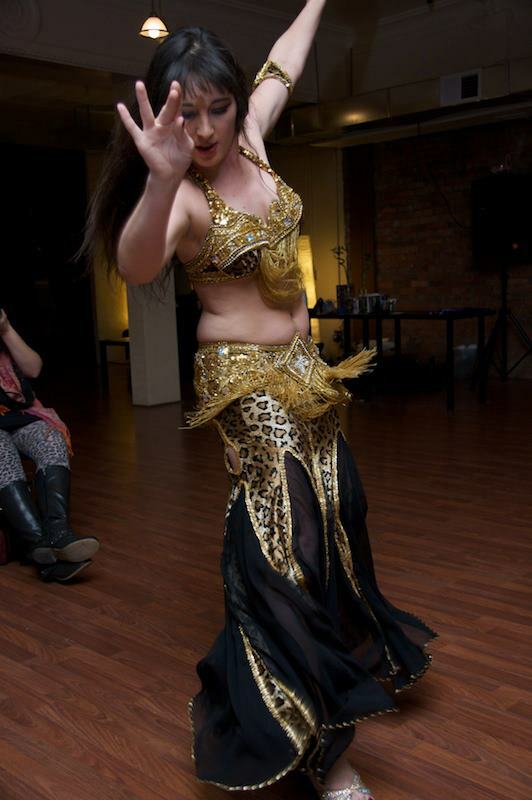 The beautiful Nancy Asiya was the previous owner and you can see her in the picture below rocking out the costume! Batting third we have a Leopard SIM! SOLD! I am not sure which number owner I am but all of the fringe is still in tact and the costume is fabulous and sturdy as are all SIM’s! 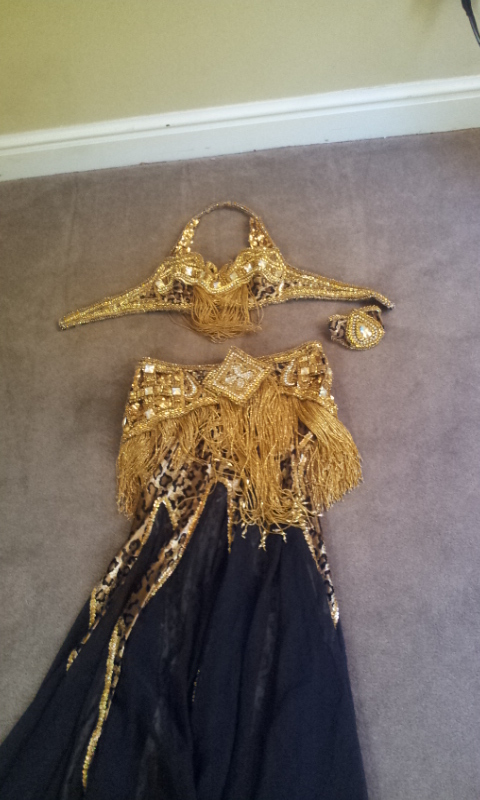 Originally owned by Jilina, this costume has some great dance vibes in it. Below you can see the amazing Athena Nile of Ohio modeling it! It comes with a bra, skirt, and one wrist cuff. Bra underbust is 28-32″ because of the stretch in the band. The cups measure 5.5v x 6.5h x 7diagonal. The skirt is 35″ long in the front and 42″ in the back but booty takes up a lot of that length! The upper hip is currently set at 31″but it can probably be a few more inches by moving the hooks.SOLD! Previous PostPrevious Dancing at the International Food Festival! Next PostNext Gold Eman SOLD!